The preferences related to script and panels editing are principally grouped on the General tab. Lets you decide if thumbnails are automatically generated for panels or not. By default, this preference is enabled, preventing you from drawings on the panels in the Thumbnails view. Turn off this option if you want to use all the Drawing tools directly in the Thumbnails view. By default, new storyboard projects are created without sequences. 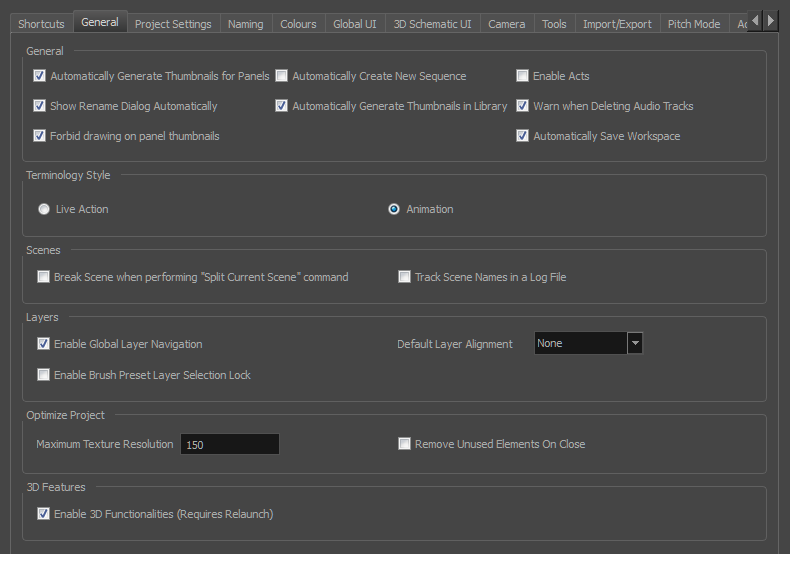 Select this option so new projects are automatically created with a sequence—see About the Storyboard Structure. Lets you decide if thumbnails are automatically generated in the Library view or not. By default this option is enabled. Starts new acts and joins selected acts which are displayed in the Timeline view. Lets you use live action terminology in Storyboard Pro that includes act, scene, shot and panel. Lets you use animation use terminology in Storyboard Pro that includes, act, sequence, scene, and panel. Tracks scene/shot name in a log file. Maintains the layer selection while navigating between panels. Keeps layer selection to layer specified in selected brush preset. None: Sets the default alignment used when creating a layer. Faces Camera: The layer is oriented to face the camera, so it rotates around its pivot point to always face the camera, but does not move with the camera. Use this option when you plan to position a 2D layer in 3D space, where that layer belongs in the scene. Pinned to Camera: The layer is oriented to the camera's perspective. The layer always moves with the camera. The advantage of using this option is you can simply draw on top of everything in the scene. The resolution at which textures will be reduced when using the Reduce Texture option in the Optimize Project dialog box. Value is in dots per field (dpf). Remove unused elements in a project when closing it.